Traffic captures: tips and tricks. I have been planning a completely different blog post for over a week now, but I’m currently not advancing in my research. Instead, due to the many experiments, I’ve become better at capturing traffic. Tools of the trade: Wireshark (Windows) and tcpdump (Unix). While tcpdump works on the command line and is very lightweight, Wireshark comes with a lot more options and a GUI. The two are compatible: capture files saved with tcpdump can be opened in Wireshark. -n – Makes sure no name resolving of addresses, and conversing of port names (e.g. 80 to www) is done. Since you’re probably troubleshooting on layer 2 and 3, it’s easier to see the actual numbers. -i int – Specifies an interface to capture on. If you don’t specify it in a recent Linux kernel, it will take the first non-loopback it finds. However, when networking, devices you encounter often have multiple interfaces. -s length – Sets the length that packets will be captured. By default only the first bytes are captured. Setting this value to 1514 will allow you to capture all packets on an Ethernet interface completely, which is handy for the -w option below. -w file – Writes the capture to a file instead of showing it on-screen. If you specify it as a *.pcap file, it can be opened in Wireshark later on! As an example of the above, ‘tcpdump -n -w /var/log/ethertest.pcap -i eth0’ will do a packet capture on interface eth0 and write the information to the ethertest.pcap file, without doing any name resolution. To stop a capture, press ‘Ctrl+C’. A more complete list of parameters can be checked here. host ip – Only capture packets that originate from or are destined to a certain IP address. The most common mistakes you can make with this filter are forgetting there’s NAT somewhere involved, so you don’t see anything because you’re filtering on an IP address that’s no longer present in the packets, or something is using IPv6 though dual stack and while you’re capturing on the right interface, nothing shows because you’re filtering on IPv4. net prefix – Only capture traffic from or to a certain subnet, e.g. 192.168.4.0/23. port number – Capture traffic with a certain port number, both UDP and TCP. Usually this is clear enough as there’s rarely both a UDP and a TCP stream on an interface with the same port number. Also counts both for destination and source port number. icmp – ICMP traffic only. Great to see if your pings go through somewhere. vlan number – Only frame that have an 802.1q header with the matching VLAN number will be captured. This option is very important on trunk links in combination with ‘-w’, as I’ve noticed tcpdump doesn’t always write tagged frames correctly to a file unless this filter is applied. ‘not’, ‘and’, and other booleans – These allow you to negate things and make combinations. ‘tcpdump -n -i eth0 not port 22’: capture all traffic except port 22 (useful when you’re connected through SSH on the same interface). ‘tcpdump -n -i eth0 host 10.0.5.3 and host 10.2.3.14’: capture all traffic between those two IP hosts. udp.port and tcp.port: TCP or UDP port number. Unlike tcpdump’s ‘port’ you can differentiate between UDP and TCP here. ip.dst and ip.src: Source and destination IP addresses. eth.dst and eth.src: Source and destination MAC addresses. tcp.stream: Filter out one single TCP stream. Useful to follow a connection in a sea of frames. Booleans can be used just like with tcpdump, and to define a variable, use ‘==’, e.g. ‘ip.dst == 10.0.0.1 and not icmp’ will show all traffic towards 10.0.0.1, except ICMP packets. Next to ‘==’ (equal to), variables can also be ‘>’ (greater than), ‘>=’ (greater or equal than), ‘!=’ (not), ‘<‘ (smaller than) and ‘<=’ (smaller or equal than). Wireshark’s extra functionality is due to the graphical element: under ‘Statistics’ you can use ‘IO Graphs’ to show bandwidth usage during the capture. This helps visualize the traffic patterns: are there sudden bursts of traffic, or just a steady flow? Here too you can filter. Under the same ‘Statistics’ there’s also ‘Conversations’, which makes a list of all captured traffic flows. You can sort this list to show the connections that use the most bandwidth. Very useful to find what’s causing unexpected bandwidth usage. There are however a few tweaks possible. First, capturing on a trunk link is possible, and it’s possible to filter out only the required VLANs using the ‘monitor session 1 filter vlan vlan-list‘. A good use of this is when trying to capture traffic on a few VLANs on a gigabit trunk link, while the SPAN port is a 100 Mbps port. By filtering only the needed VLANs less traffic will be replicated and the 100 Mbps link will not saturate as quickly. Second, while a SPAN port replicates most traffic, it does not replicate switch control frames like BPDUs and CDP frames. You can force the replication of these frames using the ‘monitor session 1 destination interface G1/0/5 encapsulation replicate’ command. A good use for this is checking why an IP Phone will not come online, for example. The above are all just small tips and tricks, but together they make troubleshooting something a lot clearer. I decided to go for it and book my TSHOOT exam for next week, Tuesday december 20. Do I feel ready? I have no idea. This exam is going to be more practical compared to ROUTE and SWITCH, so it’s going to be different. Luckily, thanks to my new job I feel confident about layer 2 troubleshooting, since that is what I’ve been doing mostly in the past weeks. A good thing really, because originally, layer 3 stuff like routing protocols was easier for me than layer 2. In the past week I’ve set up a SPAN port, did troubleshooting on port channels, had to calculate PoE budgets on access-layer switches, checked VLAN usage and spreading, and so on. The SPAN port was one of the bigger challenges, as I had to do it on a Nexus, which is a whole different beast at times compared to a Catalyst switch. Perhaps more on that in an upcoming blog post. Reviewing IPv4 routing hasn’t posed any problems so far. Even reviewing NAT again went easy. IPv6 had a surprise for me (note: redistributing something into RIPng requires a metric to be set), but no big problems either. I’m putting more emphasis on ‘debug’ commands now. I’ve hardly used them so far, but I will need them on the exam. I was able to find out a typo in my EIGRP authentication keys with it in my lab practice. Together with the ‘show’ commands they’re probably my key to passing it. So no new blog post until I’ve done the exam. I hope it’ll be a very happy one. Testing a new toy: the Flukes. My colleagues were kind enough to let me borrow a Fluke Linkrunner Pro and a Fluke Service Provider Assistant for the weekend , to let me get familiar with them. Since this kind of gear is unaffordable for a home lab, I took the opportunity to do some tests on my equipment. 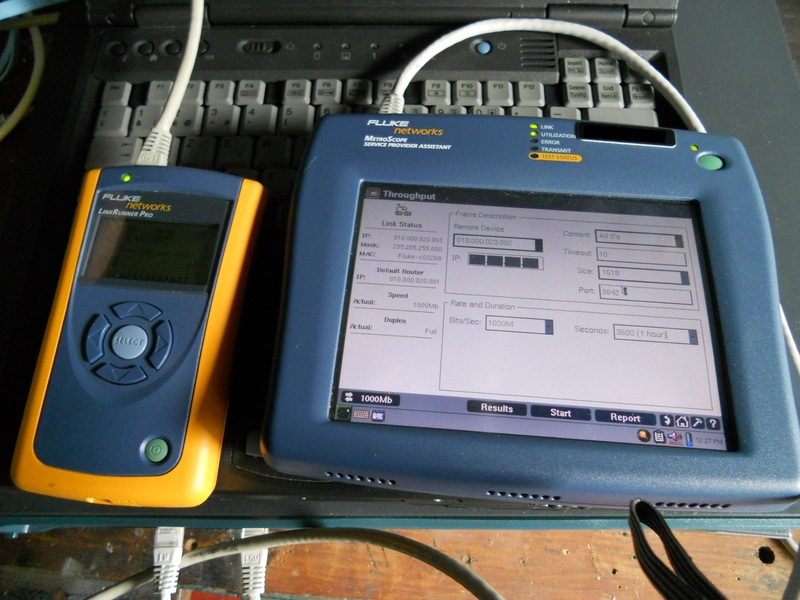 The Linkrunner Pro (left on the picture) can provide several details about a network connection. It shows the cable length of any Ethernet cable you connect it to, even if that cable isn’t connected on the other end! It also indicates when one or more of the eight internal wires are damaged, and detects PoE, again telling what is delivered through which wire. Some initial tests indicated the wire from my lab to my ISP uplink is 28 meters, my 3560 uses PoE mode A, and a 4 meter long cable I patched myself had one disconnected pair. The Service Provider Assistant can be connected both by Ethernet and an SPF module for fiber connections. It can do ping, tracert, perform jitter tests, and in combination with the Linkrunner Pro it can do a throughput test. This is a useful test: you connect the Linkrunner on one end, give it an IP and set it to ‘reflect’, and on the other end of the network, you connect the SP Assistant and let it generate traffic to the Linkrunner’s IP, up to 1 Gbps. First thing I wanted to know was whether my 2970 switch could really reach gigabit speeds. I connected both devices to the switch, gave them an IP in the same subnet, and started a throughput test. I let it run for 10 minutes because the switch only shows average throughput over 5 minutes. I did several tests, using different ports, and each time ended up with an effective throughput of 980-985 Mbps, using an MTU of 1518. Not exactly one gigabit, but 98.5% is close enough. I also monitored CPU during the test, which averaged at 4%, about the same when completely idle, proving that switching is done in hardware on the device. The 3560 has 100 Mbps ports, and the throughput test between two ports in different VLANs (and subnets) gave a result of 97 Mbps. CPU idled at 5%, because routing is done in hardware using Cisco Express Forwarding or CEF, a multi-layer switching technology. However, when forcing the routing to software with the ‘no ip route-cache’ command on the SVIs, things changed slightly. Throughput was still 97 Mbps, but the CPU went up to 8%, with a few peaks that weren’t there before. That 3% difference isn’t much, but I’m just congesting two ports. Following this logic, 24 ports routed in software at 100 Mbps should use about 40% CPU, and 48 ports 75% CPU, not including other processes such as routing protocols, spanning-tree, access-lists,… This makes clear that routing in hardware can really make a difference by increasing switch stability. 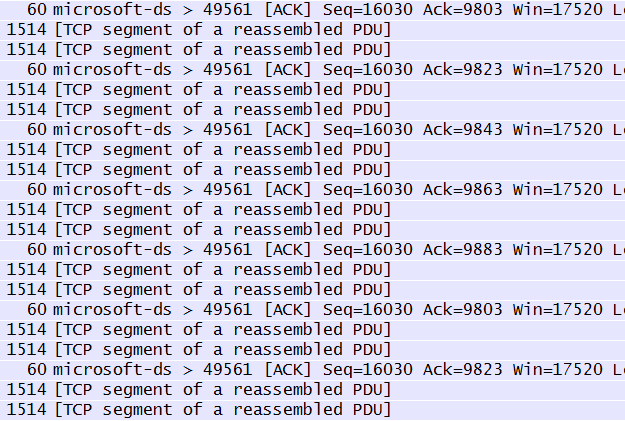 Finally, I also tested frames with 64 bytes of payload instead of the MTU of 1518. While supposedly this takes a higher toll on the switch’s resources compared to large frames, I didn’t note any differences in my simple tests. Just a few things learned, progress nonetheless. It’s friday again, facing the weekend. The good news is: this is my last day at my current job, starting Monday I’m officially a data center network engineer (same employer). Happy that my studies have paid off! On the other hand, I bragged about my studies, so I now better finish off that TSHOOT exam and prove my worth. I haven’t blogged a lot lately, but I did make a contribution to the networking-forum.com with a blog post. Special thanks to Steve (the owner) for making this possible. Finally I’ve had some time to work in my lab again, but I couldn’t test anything I wanted to test. So far I’m unable to bridge an interface (loopback of physical) on Ubuntu with GNS3. I need more knowledge to properly set up my IP Phones for testing, a RADIUS server would be nice, and I’m currently negotiating a new device for my lab but that’s taking longer than expected (spoilers…). So all in all, I’m spending more time configuring operating systems than doing actual labs. Part of the experience I suppose. When setting up larger OSPF networks, also configure a router-id. Chance that a duplicate id is formed using a physical interface ip is small, but the ‘show ip ospf database’ command makes no sense if you can’t recognise which router sent which LSA. Windows 7 will show when 802.1x authentication fails. Very useful. Ubuntu gives a lot more options for 802.1x, but doesn’t give that much output. Without a config to work with, an IP Phone will not allow communication between the daisy-chained computer and the switchport. I’m going to need a tftp config server, and learn some voice. I’m going to have to learn SSLVPN. I got to test one briefly and it’s above my level of understanding. Luckily I’ve got a CCNP Security Secure 642-637 eBook, purchased through a Deal of the Day by CiscoPress. And finally, looking at my last blog posts, I like making lists. Seems the best way for my mind to absorb knowledge, and I assume many people will agree on that.